This week is Shakespeare Week, a national campaign to inspire and enthuse people about William Shakespeare. 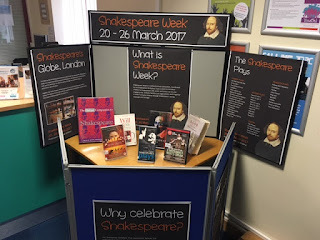 There's still chance to catch our Shakespeare display where you can find out a bit more about the Great Bard or enjoy one of his many plays and/or poems. We also have a number of Shakespeare Graphic Novels and DVDs on offer too. Please ask a member of LRC staff for more information.